1. Which connection type should I choose during WAN settings? It is recommended to choose automatic connection type- Dynamic IP" for most situation. 2. Connected correctly but not able to access internet,might shows as "connected, no internet"
Disconnect both of your modem and router for 30 sec, then re-connect them back. You need set up password for your Wi-Fi. Go to router login page, click Wireless" - "Encryption" - "WPA-PSK/WPA2-PSK" – "Wi-Fi Password", you can always change your Wi-Fi name from here. 4. May I use this router as Wi-Fi Extender? Yes. Power the router on, when you first set up. Choose WISP, and connect your Wi-Fi with your password. After that, there will be a new Wi-Fi name from our router. 5. Why I typed 192.168.0.1 or EDUP.CC correctly butit come out many results instead of the router login page? Make sure you directly type in the address bar not any search box. It is normally located in the top of a browser. 6. Able to access internet but can’t login with 192.168.0.1 or EDUP.CC. Card-King Wifi router works great for wireless internet in homes and offices with 1 to 30 or more Wi-Fi devices. The high power router has 3 access points, 2.4GHz, 5GHz, Guest. The guest WiFi does not need a password, but need the owner of the router to access the Internet. Highly recommended routers for restaurants and multiplayer apartments. 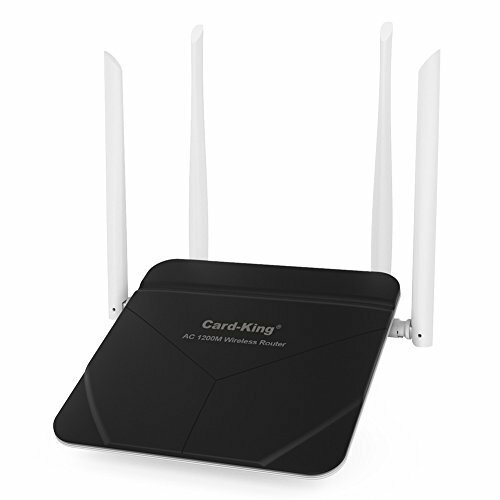 Card-King Dual-Band wireless router delivers up to 300Mbps at 2.4GHz or 866Mbps at 5GHz, which allows you to experience smooth online gaming and video streaming with better connections. Please note that your actual speed is based on your internet service. If your Internet service at a maximum speed of less than 100Mbs, i highly recommend the use of cardking routers . Otherwise, choose NETGEAR Nighthawk WiFi Router. This amazing smart router can be used as wifi repeater if you choose the "WISP"mode. Provides 2-YEAR WARRANTY or a new replacement if product does not meet your satisfaction . If you have any questions about this product by Card-King, contact us by completing and submitting the form below. If you are looking for a specif part number, please include it with your message.